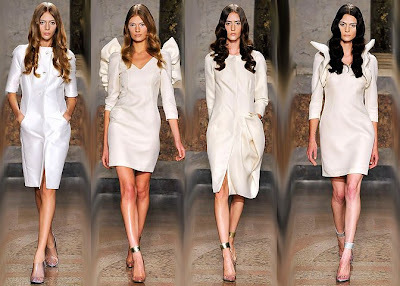 These outfits are part of Francesco Scognamiglio's SS09 collection. Some of the outfits, which I didn't include in this selection, are too... dangerous. Oh yes, quoting from style.com: "a perfect mix between elegantly chic and risque." There you go. Also found out that Scognamiglio opened his first atelier when he was only 23. His design methods can be characterized by a “strange dichotomy between research, experimentation and avant-garde inspirations on one side and the traditional principles of the Neapolitan tailoring school on the other.” Obviously he is not so interested in selling the items, judging by some of his designs which remain just eye-candy. Keep being effervescent. I almost laughed my heart out there. What I loved was the large variety of little white dresses. Angel-like dresses, complete with ruffles and something that resembles wings. Flamboyant, but should be relevant when it come to retail, too. If he could bring the garments to be more wearable, he might attract more clients. His skills are remarkable, and it would be interesting to see an upcoming collection that does not center itself so much on sheer garments or extreme materials to make itself credible. Style, again: "He can cut a lean, mean suit with the best of them—but he'll never graduate to the big leagues like his front-row pals Tommaso Aquilano and Roberto Rimondi have until he turns down the kink factor." True that. If you want to check out the rest of the collection and those risque pieces, go here. Oh thanks for posting. I especially like the first row of dresses, done up in my favourite colour too. I like all of the white. The plunging necklines look so elegant on the models, but imagine them on women with actual chests! @the clothes horse: you are so right! and i didn't post the ones with more dangerous necklines, ahem. oh well, i suppose they will be just more eye-candy..